Subacromial bursitis has similar symptoms to Supraspinatus tendinitis, with shoulder pain over a 60-degree arc when the arm is lifted sideways. The subacromial bursa is a sack of fluid over the tendon which helps facilitate movement. This can become trapped, especially in sports where the arm is regularly at or above shoulder level. Resting from these activities helps stop the pain, and once pain-free, you can start doing rehabilitation exercises. Symptoms of subacromial bursitis can be similar to those of supraspinatus inflammation or injury in the shoulder. There will be pain and weakness in the arm, particularly when it is lifted sideways through a 60-degree arc. Pain may also be felt when you press in at the inside front of the upper arm. If it is the tendon that is injured rather than the bursa there is likely to be more pain when the arm is lifted up sideways against resistance. What is a subacromial bursa? The Supraspinatus muscle runs along the top of the shoulder blade and inserts via the tendon at the top of the arm or humerus bone. This muscle is used to lift the arm up sideways and is also important in throwing sports as it is the muscle that holds the arm in the shoulder when you release what you are throwing. There are massive forces involved in slowing the arm down after you have thrown something, but few people bother to train these muscles preferring to concentrate more on the muscles the accelerate the arm rather than decelerate it. A heavy fall onto the shoulder can also result in injuring the supraspinatus muscle. Over the tendon is a bursa or small sack of fluid the purpose of which is to help lubricate the moving tendon. 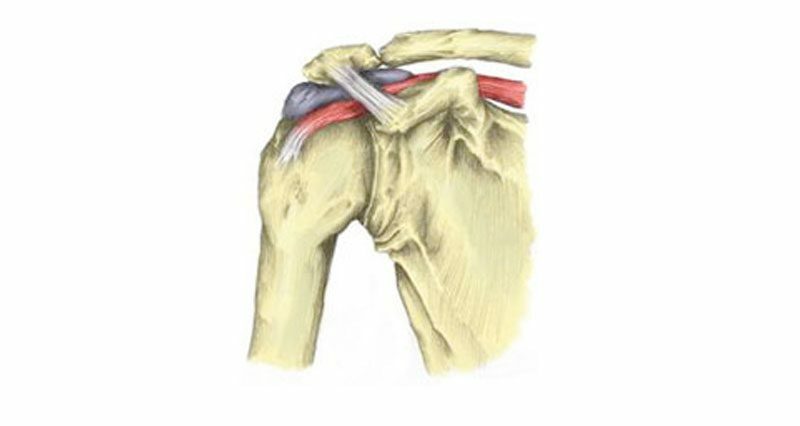 This bursa can become trapped in the shoulder causing pain and inflammation. The athlete is more prone to this injury if they overuse the shoulder particularly in sports where the arm is at or above shoulder level. Or if the athlete has previously had a rupture of the supraspinatus tendon. Rest until there is no pain. Rest is important as every time movement causes pain in the shoulder the time taken to recover will be longer as the bursa becomes inflamed and swollen. If possible however continue pain-free mobility exercises to keep the full range of movement in the shoulder. This is important to prevent loss of movement in the shoulder and eventually muscle weakness. Apply cold therapy to reduce pain and inflammation. A cold pack or wrap can be applied every hour for 10 minutes reducing to 4 times a day as required. See a sports injury specialist or doctor who can advise on subacromial bursitis treatment and rehabilitation. A doctor may prescribe anti-inflammatory medication such as ibuprofen. This will help reduce pain and inflammation quite quickly although always consult a doctor before taking medication. Ibuprofen should not be taken if you have asthma. They may prescribe a full rehabilitation program to include mobility and strengthening exercises. If Subacromial bursitis does not respond to normal conservative treatment of rest and cold therapy then a doctor may aspirate the bursa which involves extracting the extra fluid through a needle injected into the bursa. A surgeon may operate on persistent subacromial bursitis injuries. Rehabilitation for subacromial bursitis based on reducing inflammation, improving mobility and restoring strength. The following guidelines are for information purposes only. We recommend seeking professional advice before attempting any rehabilitation. The aims of subacromial bursitis rehab are to reduce pain and inflammation, improve or maintain mobility, strengthening the shoulder with exercises and finally to gradually return the athlete to full function and fitness. If they have an unstable shoulder joint where there is a lot of movement and weakness in the joint for example from previous injury or a shoulder dislocation. If you are not sure, see a sports injury professional. Failure to recognize this may mean the injury is likely to recur. Poor technique or bad training habits. Overuse or training too hard is just as likely to cause injury as poor technique. If not sure, find a good coach. Weakness in the rotator cuff muscles. Strengthening exercises should not be neglected just because the pain has gone. Stage 1: To reduce pain and inflammation. Apply cold therapy or ice to the shoulder. This will help reduce pain and inflammation. Apply ice for up to 15 minutes every hour, gradually reducing the frequency of applications as the shoulder improves. Rest the shoulder. Do not do anything that causes pain. Every time the athlete causes pain, they may be making the injury worse. If necessary, use a sling to restrict movement then do so but only for a few days. NSAID or anti-inflammatory medication (e.g. ibuprofen) may help in the early stages. Always check with your Doctor before taking medication if you are not sure. Range of motion is done through shoulder mobility exercises, gradually increasing the range of motion the joint will go through pain-free and specific stretching exercises to stretch all muscles around the shoulder joint. Sports massage techniques can help to improve greatly the condition of the rotator cuff muscles, so allowing more joint flexibility and better response to strengthening exercises. Strengthening exercises concentrate more specifically on the external rotator muscles (the ones that rotate the arm out) and the scapular stabilizers (muscles that support the shoulder blade). It is also important to strengthen the whole joint. Strengthening exercises must be done pain-free and in conjunction with stretching exercises. These exercises need to be specifically tailored to the athlete’s sport. For example, throwers would start throwing a tennis ball against a wall. Five sets of 20 throws gradually increasing the number of sets and number of repetitions assuming no pain during, after or the next day. Obviously every injury is different, however, the athlete is usually able to resume sports specific training after between 1 and 3 weeks. If the injury is neglected it can become chronic and be very difficult to treat resulting in a cycle of rotator cuff injury and impingement of the shoulder joint.